The 2019 Guanajuato workshop is full. Contact me to be placed on the waiting list or to be notified once details are available for the 2020 program. Treat yourself to an exciting art adventure while immersing in Guanajuato, considered to be the jewel of the Colonial cities of Mexico. Experience this European inspired city full of winding narrow streets and leafy garden plazas below which a labyrinth of tunnels and passageways serve as the thoroughfares of the city. By day Immerse yourself in an intensive art making workshop and take the evenings to enjoy the cantinas and cafes, strolling troubadours and string quartets in intimate settings. The numerous museums of art, history, churches and even the famous mummies all serve to make Guanajuato, still one of Mexico’s best-kept secrets, a fascinating destination for an art making getaway. The workshop focuses on monotype as a tool for mixed media printmaking. Using Akua non-toxic water-based inks, participants of all levels will learn monotype through various methods of mixing, modifying, layering inks, using and abusing mark-making tools, and exploring the limits of paper. Instruction includes a wide range of uses for chine colle, collage, and drawing. Image transfer techniques will also be taught. If you have ImagOn, Solarplates, or other matrix, feel free to bring them. These can be incorporated with multi-plate printing methods, opening the door to limitless opportunities. The emphasis is on “the artist as an inventor,” and each participant will be encouraged to stretch his or her methods of expressing and breaking barriers into new and uncharted territory. The information presented is cumulative and participants will have the opportunity to revisit their works-in-progress over the course of the week. An optional materials list will be sent to each registered participant as it gets closer. If you have any questions regarding the coursework please contact Ron Pokrasso, pokrasso@gmail.com or have a look at the website, www.ronpokrasso.com. 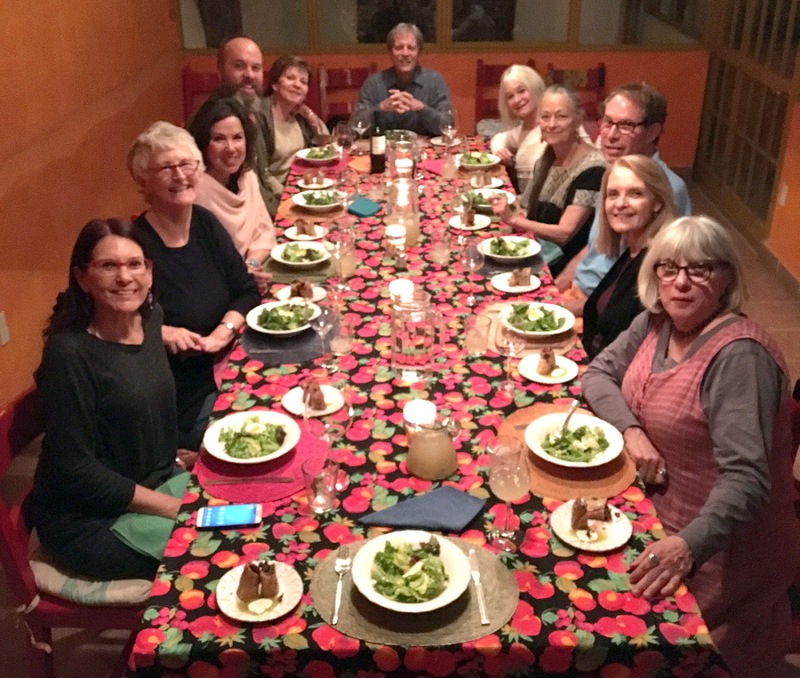 The program begins with a festive welcome dinner and orientation at Alma del Sol on Tuesday, Jan 29. The workshop takes place at Piramidal Grafica. With two large presses and ample workspace for 12 participants, this professional printmaking facility is well suited to serve all the creative needs of workshop attendees. Seven days have been allotted for the program including a “day off” on Saturday, Feb. 2 when participants can take the time to explore the City and Region. Optional excursions are possible at additional cost. There is a minimum of 36 instructional hours, 10am-5pm each day (except Saturday, Feb 2). Most printmaking materials such as Akua inks and modifiers, monotype plates, tools, adhesives, paper towels, rags, solvents, etc. are included. Arches 88 paper is available for purchase @$6/sheet. Our host Hugo Anaya promises wonderfully prepared lunches each of the instructional days. Hugo, as well as Linda Soberman, will serve as assistants for the workshop and will provide all the necessary information to help make this a memorable visit to Guanajuato and a rewarding artistic adventure. The program culminates with an informal critique and discussion to serve as closure and celebration on the final day of class. The tuition $1095 includes 36 hours of instruction, most studio supplies, a welcome and farewell dinner and 6 in studio lunches. Contact me first with your interest and then send a $395 deposit to hold your space. Your deposit is fully refundable until Dec 1, 2018. The balance is due Dec 15. After Dec 15 refunds (less a $100 admin fee) are possible only if your space can be filled. Hugo Anaya runs Alma del Sol, www.almadelsol.com, as well as Hotel de Color, www.facebook.com/callejoncalvario9/. Both are centrally located in the old downtown area near the Jardin. For our program he has reserved 9 rooms that can accommodate 1 or 2 people each. These accommodations are $80-$100 per night/ room, including breakfast and are available on a first come basis. Contact Hugo directly at info@almadelsol.com to make your arrangements. Contact me if you need assistance in finding a roommate. As another option, Hugo recommends Hotel Casa del Agua, www.hotelcasadelagua.com.mx/index-en.html. You are also free to make your own arrangements for lodging. All lodging accommodations are a short cab ride or an invigorating walk to and from the studio. Participants are responsible for their own travel arrangements to and from Guanajuato. You will likely fly to Leon (BJX). Participants will be given instructions for transport to Guanajuato. After your week in Guanajuato consider traveling to San Miguel de Allende. Linda Soberman has agreed to help with housing and tours in this wonderful city just an hour and a half from Guanajuato.